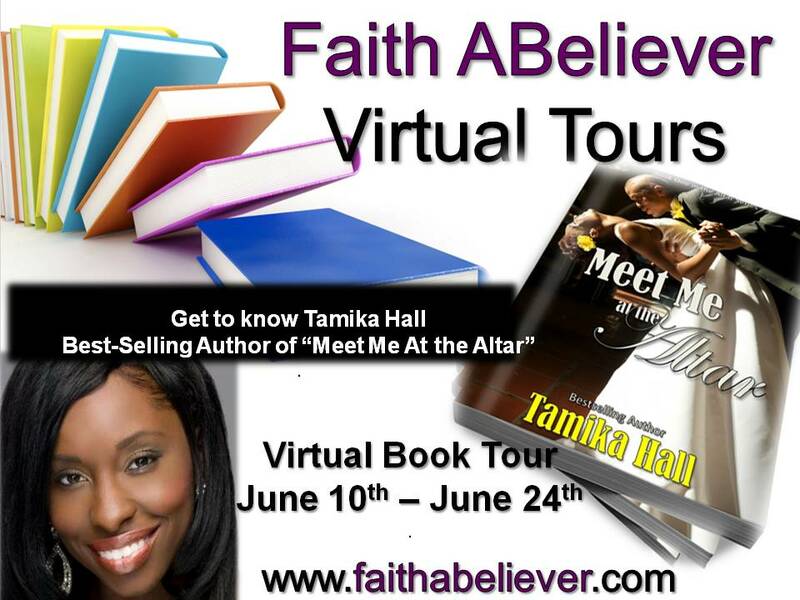 Follow FAB Virtual Tours with Christian Fiction Romance Novelist Best Selling AuthorTamika Hall. Novel "Meet Me At The Altar,"
During the tour will be some great GIVEAWAYS! Host: Sharvette Mitchell @ 6:00 pm est. SHANA JACKSON used to believe in love...that was until she caught her husband in the arms of another man. DEREK CHANCE is used to a challenge; so if Shana didn't want him to romance her and treat her like the queen she is, then she should have never sat by him during Sunday morning service. SHAWN MCALLISTER has everything he could ever want - prestige, wealth, a beautiful wife and daughter...so why is he squandering it on other women? SHERRY COLEMAN is a gold digger and proud of it - you better watch out, because she might be messing with your husband! Meet Me at the Altar chronicles the life of four adults as they battle domestic violence, divorce, low self esteem, and prostitution to finding the perfect peace within themselves and discovering that true love comes from God first. Will they accept God's invitation? “Electrifying, Spunky, and Determined,” are words often used to describe Tamika Hall. Tamika has become one of the most sought after theatrical motivational speakers in the United States! With over 20 years performance experience and nearly 10 years as a professional speaker, Tamika lights up the stage as a Keynote and Conference speaker, leadership speaker, teen dating violence & domestic violence speaker, faith speaker & performer, and cultural diversity speaker! Combining her performance experience with her career in education and corporate America, Tamika easily relates to youth, adults, educators, and corporate executives. Tamika is the host of her own radio show, the Tamika Hall Radio Show, and is the Bestselling Author of ten books, including the award winning, Love Doesn’t Leave Bruises: A Young Woman’s Guide to Conquering Dating Violence which is utilized by domestic violence agencies, and as a text book on the university level. An award winning graphics designer, Tamika has several clothing lines: which can be found in her online boutique: Rock Your Faith! In July 2010, Tamika was named Playwright of the Year by the Black Gospel Play Association for her play, How to Love A Saved Man on tour.